One of the cleverest ad campaigns I have been involved with was for Black Star Beer in 1992. A "Make-Believe History" was created for the newly started brewery by the Wieden & Kennedy agency, directed by Alex Proyas. The ad featured a montage of pretend commercials from the past, presented by announcer John Corbett (of Northern Exposure fame). My contribution was to animate Zippy The Cap, an iconic talking bottle cap character, supposedly from the year 1950. 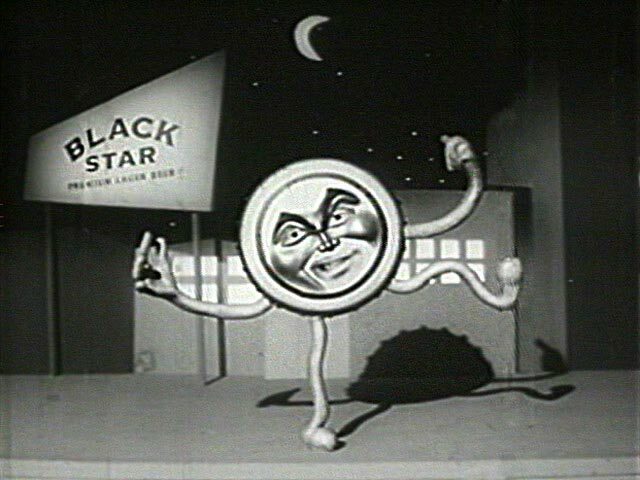 There were 4 shots in the Zippy sequence: a bottle opener popped Zippy off the bottle, he flew spinning through the air growing arms and legs, then landed in a city street, and in close-up spoke to the audience about Black Star Beer. My main concern was to create the character performance, since the props, set, and Zippy puppet were already made for me when I arrived on stage. Alex Proyas gave me some initial direction on what he expected, then left me alone to do my stop-motion wizardry. Three shots required a flying rig, but I did not have to worry about making the wires completely invisible. Because we were going for a vintage look, it was OK if the wires showed or the animation was funky. Zippy's cap body was about 10 inches across, therefore the beer bottle and opener were huge! In order to animate the bottle opener, I attached it to a c-stand and manhandled it into it's poses. Surface gauges were utilized to make sure the incremental movements were smooth enough. A series of replacement parts gave the illusion of growing arms and legs as Zippy hurled through the air. For facial expressions, I used clay for movable eyebrows and eyes. The mouth was easy; I didn't have to do anything as it was accomplished in post. Alex wanted "Clutch Cargo" style lips, meaning a real human mouth was superimposed onto Zippy. Overall it was great to have the opportunity to help create a fake fifties icon! An actress plays a sixties waterski girl in front of a projected background. For some reason I did not shoot any behind the scenes photos of the Zippy setup. However, in a nearby stage Alex and crew were shooting the 1960s' waterskiing babe, which intrigued me enough to document the process with a couple photographs. The actress performed in front of a rear projection screen, which gave the illusion of waterskiing on a lake. Real water was sprayed to further add to the effect. These efforts were not intended to appear truly convincing, part of the charm was that it looked like what it was; a staged fake. Just another make-believe Black Star Beer advertisement from the past! A side view shows the water spray machine setup for the waterski illusion.